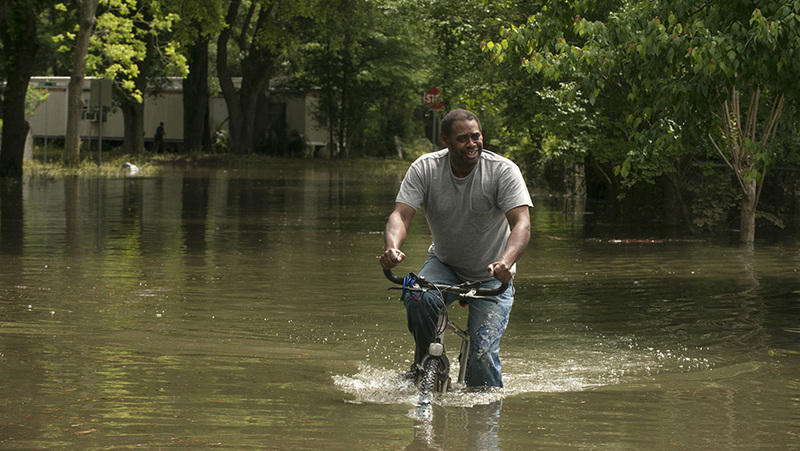 Tyron Charles makes his way to a friend's house in the Kelly Ave Basin area in Pensacola, Florida, May 2, 2014. A state of emergency was declared on Wednesday in Pensacola's Escambia County after being inundated by as much as two feet of relentless rain over a 24-hour period, as severe thunderstorms raced across the northern part of the state. We know now that America's East and Gulf Coasts will be flooding more in upcoming years because of climate change. But how much? And how do you show that in a way that people can understand? That's what we're trying to do, with Vanilla Ice, in this data visualization app. We use data from this report, which may carry greater resonance on the 10th anniversary of the Katrina disaster and just weeks after President Barack Obama's new initiative on climate change. Here's how much more often these American cities will be flooded. Wait, Vanilla Ice? We're using sound and video to illustrate the projected floods. Learn about how New Orleans has changed since Hurricane Katrina. Think of the number of tidal floods as the tempo of a song, say Vanilla Ice's rap single "Ice Ice Baby." The number of floods that we experience today might look normal, and this is represented by "Ice Ice Baby" played at its normal tempo. Now try this: for every increase of 10 floods in a year, speed up the song by one second. How fast will the song be when the number of floods hit 388 a year (Washington DC in 2045)? The report was released in October by the Union of Concerned Scientists, a nonprofit science advocacy organization. It projects how many tidal floods will hit 52 locations along the East and Gulf Coasts in the next 30 years. The numbers are pretty gruesome. For example, Washington DC will face 388 tidal floods in a year in 2045, a nine-fold increase from the current 43 tidal floods a year. Key West, Florida, might lose its charm in 2045 when the number of tidal floods are projected to skyrocket 71 times from 3 in a year to 212. A note on data: The numbers of tidal floods today represent the number of times that tide heights, as measured at the nearest NOAA tide gauge, exceed local water level thresholds that have been established by the Weather Forecast Offices of the National Weather Service as triggering local flood conditions. These figures are an annual averge, based on the five-year period from 2009 to 2013. The 52 locations were selected by the study based on whether the flooding thresholds, defined at the gauges, correlate well with coastal flood advisories issued by the National Weather Service. For simplicity, PRI.org further reduced the number to 29 by removing locations that are close to each other.